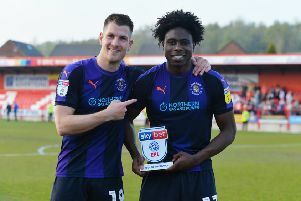 Hatters midfielder Glen Real has been backed to play a huge part in Town’s League One campaign this season by boss Nathan Jones. The 23-year-old has featured for just three minutes so far in the opening two games, coming off the bench during the 1-1 draw with Sunderland on Saturday for his first outing. “He finished the season strong last year, he missed the first game last year and then got in and I envisage Glen paying lots and lots of games. “I love Glen and he’s so versatile, he does a job wherever he plays and he wants to get better and he is getting better. It could be that Rea comes into the side for Alan McCormack at the Hawthorns this evening after the 34-year-old missed six months of last season due to calf and groin injuries, returning for the run-in and doing enough to earned a new contract. He has played both of Town’s matches so far this term, looking strong on each occasion, though when asked if he could be given a rest against West Brom in the Carabao Cup, Jones continued: “It might not be, as we’ve got to pick a side accordingly. “What we’ve not go to do is think,''we’ve got to rest him,' we’ve got to pick a side that can go and be competitive against a West Brom team. When asked how he thought McCormack had started the season, Jones said: “Fitness-wise, yes, very, very well. "I thought he could have had more of an influence on the game on Saturday like a few of our players as I think although it was a real good point and we competed with a fantastic side, I feel that we didn’t bring our best side out on Saturday. Meanwhile, the likes of Sonny Bradley, Andrew Shinnie and Jake Jervis will all be vying to make the team after roles on the bench so far, as Jones added: “There’s probably another 13 who are desperate for a start, if you went all the way down to Frankie Musonda and people like Arthur Read. “They’re desperate as well and have done really well in pre-season, so they’re all chomping at the bit. “I can only pick 11 and that’s the problem I have at the minute, keeping everyone content. “You’re never going to keep everyone happy, but you’ve got to keep them content, so that’s the decision.